Pajama Press is pleased to announce that Graffiti Knight by Karen Bass has been nominated for the Pacific Northwest Library Association Young Reader’s Choice Award. This award program, open to participants in three age groups from Alaska, Alberta, British Columbia, Idaho, Montana, and Washington, asks children and teens to read a shortlist of nominated titles and vote for their favourites. Voting takes place in March and April. Learn more at www.pnla.org. 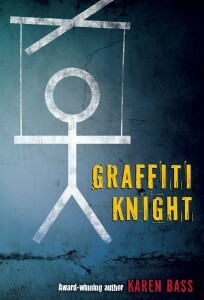 Graffiti Knight is a Young Adult novel set in Eastern Germany two years after the close of World War II. 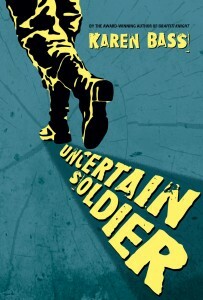 Its protagonist, sixteen-year-old Wilm, chafes under the unjust strictures of Soviet rule and seeks a way to speak out. Graffiti Knight, a USBBY Outstanding International Book selection,has won the Geoffrey Bilson Award for Historical Fiction for Young People, the Canadian Library Association Book of the Year Award, the R. Ross Annett Children’s Book Award, and the Exporting Alberta Award. It has also been nominated for the B.C. 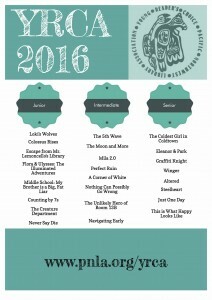 Teen Readers’ Choice Stellar Award, among other honours. Click here to watch the Graffiti Knight book trailer. Click here for interviews with Karen Bass. Click here to download the free Graffiti Knight classroom discussion and activity guide. 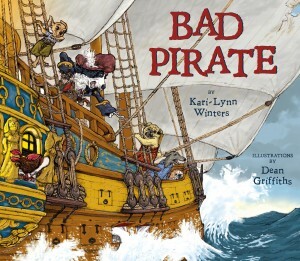 “The text begs to read aloud by a parent or teacher with great dramatic flourish and a pirate accent. Words that describe different character traits are highlighted for emphasis. The slang and nautical terms are included on the endpapers….As always, Griffiths’ artwork is outstanding. 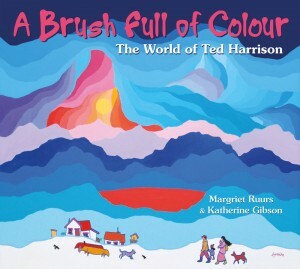 The lively text is wonderfully complemented with high-spirited and energetic drawings, full of bold colours and great detail. Bad Pirate is artfully designed. Much of the pirate dialogue cleverly appears on floating pieces of sail. The pirates’ being portrayed as very expressive dogs has a dynamic comic effect. Various breeds are cleverly used, and these delightful “sea dogs” should require a second look. Griffiths also makes use of many different perspectives to simulate vibrant sea action. 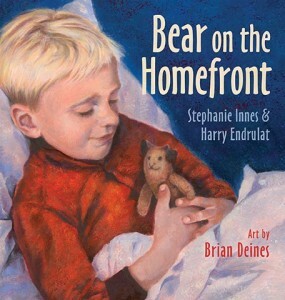 Visit the Canadian Children’s Book Centre website to order your copy of Best Books for Kids & Teens today. 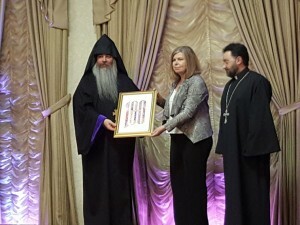 Pajama Press author Marsha Forchuk Skrypuch was honoured on May 22, 2015, by the Armenian Prelacy of Canada. Among Skrypuch’s many books for children and teens are six that are set during or after the Armenian Genocide, an event whose centennial anniversary is being marked this year. 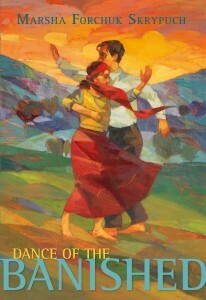 In 2014 Pajama Press published Skrypuch’s YA novel Dance of the Banished, which is set in Canada and Anatolia during World War I. In it Zeynep, a teenaged Alevi Kurd, is a witness to the Armenian Genocide and resolves to save as many of her Christian Armenian neighbours as she can. A dusty road leads to a schoolhouse nestled under a canopy of giant trees. A little girl stays in to do her homework at lunch, because by the time she walks the long way home, it will be too dark to see. Thus we are welcomed gently into Anna’s world in rural Tanzania, where the big event is the arrival of a heap of bicycles on a truck, in a cloud of dust. Although Anna is too late to get her own bike, she happily helps her friends learn to ride theirs, and soon she is bumping home on the back of Mohammed’s bike. And then he does something unexpected, and the joy at the centre of this story unfolds. 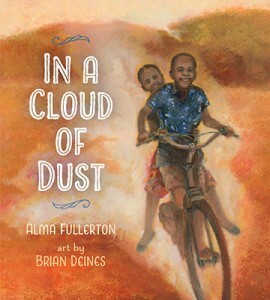 In A Cloud of Dust by Alma Fullerton is a simple, quiet book that resonates with all the ways that Anna’s life is different from ours. The modest gift of a bicycle makes a profound change in her daily life, and a note at the back of the book gives information about the many bike charities that bring bicycles to Africans. But the bicycle is only the jumping-off point for what this book is really about: the spirit of community that shines through as Anna and her friends help each other. Brian Deines’ drawings are saturated with colour and full of movement: his wobbly bicycle riders struggle to keep their balance and you can almost see the wheels spinning when one of them tumbles to the ground. This glowing book is a wonderful introduction for young readers to life in a culture where many things are different, but some things are exactly the same. “…Many of the fictional Max’s experiences really happened to Hartmann Nagel, a friend of Bass’s father whom she consulted in researching Uncertain Soldier. Nagel also provided information about logging camp life in that era. 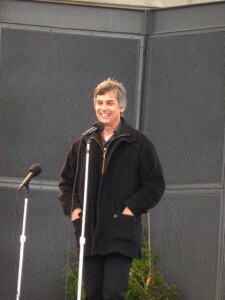 Christmas, who plays a pivotal role in finding Max, is based on a Cree man who worked part-time on Bass’s grandfather’s farm. Despite the title, a boy named Ben is feeling anything but big—his older, school-age siblings get report cards, can swim, and have no trouble using chopsticks when the family goes out for dinner. 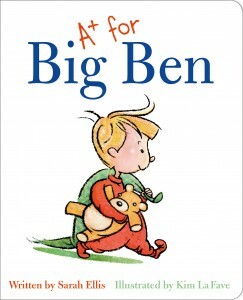 Luckily, siblings Robin and Joe sense the preschooler’s unhappiness, and they create a report card just for Ben. His subjects include feeding the cat, shoe tying, and “making us laugh,” and he gets A-pluses across the board. Loosely defined by rough, crayonlike lines, LaFave’s images have a swoopy, gestural quality; like Ellis’s text, they take a minimalist approach to the range of emotions Ben is feeling, from jealousy to disappointment and pride. Ages 2–up. 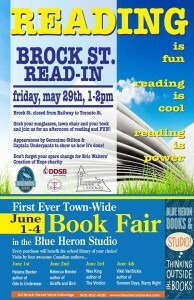 On Friday, May 29, Uxbridge, Ontario, will be showing the world how much it loves to read. That day marks the beginning of the town’s first-ever town-wide book fair, a multi-day event that will support local schools and showcase Canadian authors. Friday’s kick-off will see Brock Street closed for an hour-long flash-mob read-in event attended by elementary students, teachers, family, and friends. 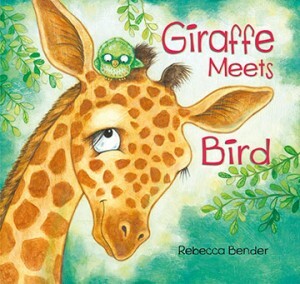 From June 1–4, a different Canadian author will be featured each day, including Rebecca Bender (Giraffe Meets Bird) on June 2nd. A portion of purchases at Blue Heron Books, the event organizer, may be applied to the school of the buyer’s choice throughout the first four days of June. The organizers encourage literature lovers to share their reading photos online at #ReadIN. 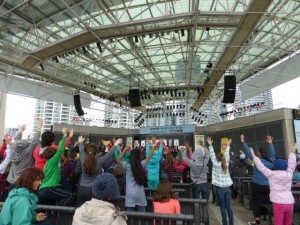 On Wednesday, May 13th, the WestJet stage at the Toronto Harbourfront was a chilly place to be, but things heated up as the authors and illustrators nominated for the 2015 Forest of Reading Silver Birch Non-Fiction Award filed onstage, to the cheers of the excited children in the audience. 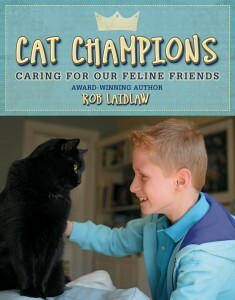 One of the nominees was Rob Laidlaw, author of Cat Champions: Caring for our Feline Friends. Pajama Press is pleased to announce that Cat Champions was selected as an honour book, one of three runners-up in the contest decided by the votes of children from schools and libraries across Ontario. Pajama Press also extends congratulations to Anneliese Carr and Deborah Ellis, authors of the winning book Anneliese Carr: How I Conquered Lake Ontario to Help Kids Battling Cancer (Lorimer), as well as Helaine Becker and Alex Ries, author and illustrator of the honour book Zoobots: Wild Robots Inspired by Real Animals (Kids Can Press). 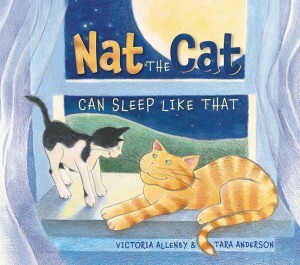 Cat Champions: Caring for our Feline Friends has also been nominated for the 2015 Hackmatack Children’s Choice Award and the 2015 Red Cedar Information Book Award. It is a a Bank Street Best Book, a Best Books for Kids & Teens Starred Selection, and a Resource Links “The Year’s Best” selection. 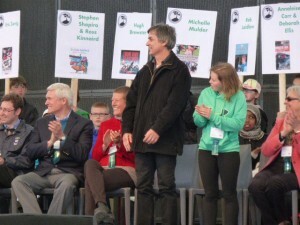 Its companion book, No Shelter Here: Making the World a Better Place for Dogs, won the Silver Birch Non-Fiction Book Award and the Hackmatack Children’s Choice Award, among other nominations and honours.